With the passing of Chester Nez, the last of the original Navajo Code Talkers, on Wednesday, we at Amizade would like to take this opportunity to continue to share the incredible story of the Navajo Code Talkers. From 1942 to the end of World War II, more than 400 courageous men from the Navajo Nation answered the call of duty, and were recruited by the U.S. Marine Corps to serve as Navajo Code Talkers. During a time when U.S. Military codes were being broken by Japanese intelligence experts, these Navajo men helped to devise and use an impenetrable code based on the Navajo Language that would assist the United States military in bringing a more rapid end to the war in Japan and the Pacific, saving countless American lives. Chester Nez was among the first group of Navajo Code Talkers recruited in 1942, often referred to as the “Original 29.″ These 29 were the first to devise the code based on the Navajo language and chosen as a because its syntax and tonal qualities were almost impossible for a non-Navajo to learn, and it had no written form. The code was incredible successful and was never deciphered by the Japanese. For over two decades following their service, Chester and the other Code Talkers had to keep silent about their role until their work was declassified in 1968, following the declassification, the group gained legendary status with books and, ultimately, a movie that was inspired by their stories. The crucial role of the Navajo language in the US military stands in stark contrast to the experience many Navajos speaking their language in their daily lives. Until recently, Navajo children, including Chester, were forbidden from speaking Navajo at school and were punished if caught doing so. Today we mourn the loss of Chester Nez, and honor his service as well as all the Navajo Code Talkers and celebrate the incredible role they and their language played in our history. 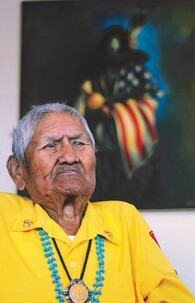 For more information about Chester Nez and the Navajo Code Talkers here (CNN) or here (Navajo Times).